As a parent, you have the important job of providing your children with the food needed to stay healthy. Since you are in control of the food supply, you can bring healthy food into the house, but it is ultimately up to your child to decide which ones to eat, or whether to eat at all. 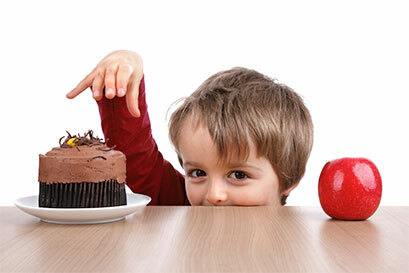 While you can steer your child toward healthy eating, you may need to do it in a clever way. 1. Start early. Introduce new food flavors, especially green vegetables, in the form of baby food when your child is about 6 months old. If your youngster does not seem to like the taste, try again in a few days. 2. Continue to offer a healthy food item, even if your child refuses to eat it at first. You may need to offer a food eight to 10 times before your child will accept it, according to the National Library of Medicine (NLM). Keep offering rejected food but do not force your child to eat it, as this may build resentment toward that particular food item. 3. Rethink the drink. Make water or milk the drinks of choice at mealtime, and offer water when your child is thirsty. While fruit juices provide many vitamins and nutrients, they also contain a lot of sugar. Teaching children to drink water instead of juice to quench their thirst will help them avoid consuming unnecessary calories. 4. Cancel your membership to the “clean plate club.” Children naturally know when to stop eating because they are born with the ability to determine when their stomachs are full. Many parents encourage their children to “clean their plates” as a way of ensuring that they get all the vitamins and minerals they need. Joining the “clean plate club” can lead to a lifelong habit of overeating. Instead, teach your child to listen to the way his or her body responds to the quantity and quality of food consumed. 5. Offer healthy snacks. Snacks provide the energy kids need to make it through their busy days. Trade your child’s chips, candy and cookies for fruit, raisins, nuts, air-popped popcorn or unsweetened yogurt. 6. Avoid distractions. Turn off the television, computer and smartphone at snack and mealtime. These distractions can steal kids’ attention away from their food, and they may lose interest in eating, or overeat because they are not paying attention to the feeling of fullness in their stomach. 7. Slow down. Try to ignore your busy schedule and slow down the pace of your child’s meals. It takes about 20 minutes for the stomach to tell the brain that it is full. Leave your child’s plate on the table for a few minutes after he or she seems to have lost interest, providing enough time for your child to feel full. 8. Set a good example. Toddlers love to mimic their parents and siblings. Be a role model by eating nutritious food, eating with family members, and eating in a comfortable environment so that you can enjoy the food you eat. 9. Avoid “food jags.” Children, especially toddlers, like to assert their budding independence by eating — or not eating — food. This means you could describe most toddlers as “picky eaters,” especially those that go on “food jags” where they refuse all but one or two foods. Most food jags will not last, especially if you serve some of your child’s other favorite foods. 10. Mix up your menu. Keep your child – and the rest of your family – interested in mealtime by eating a variety of food throughout the week. Include an assortment of established favorite foods and one or two new foods in your weekly menu. You have a great amount of control over the supply line of food to your house and have tremendous influence over your children’s eating habits. Instill good eating habits in children while they are young, and they will likely maintain these healthy habits into adulthood. Author Bio: Dr. Abhijit Shinde, Medical Director at Aayu Clinics Lakeview Immediate Care, has a long history of experience in primary care, urgent care and ER. A graduate of the University of Arkansas for Medical Sciences, Dr. Shinde is invested in every patient’s health, whether he or she needs pediatric care, treatment for a mild fever, allergy treatments or more.